Looking for Fun & Adventure? Join Our Team! You'll assist children and adults with disabilities in park-district like programs including: arts/crafts, sports/fitness, dance, camps, Specil Olympics, & more! 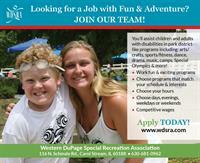 Work programs that interst youFlexible hours/scheduleCompetitive wages Apply at www.wdsra.com!